What Makes Leafsong Family Flower Farm Unique? No question about it, the life of a farmer correlates with hard work. The responsibility of loving and raising children involves around-the-clock care and commitment. Being a single parent presents additional challenges. Choosing to educate you children at home instead of in a school setting adds even more responsibilities to the job of parenting. 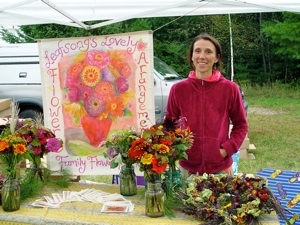 Stacy Leafsong of Leafsong Family Flower Farm is a woman farmer, single parent, artist, and a homeschool educator whose working very hard in tapping her skills to provide a good life for her three children. If you have ever had the opportunity to check out Stacy’s booth at the Blue Hill Farmers’ Market, or the Bar Harbor’s Eden Farmers’ Market, or at the Common Ground Fair, you probably will remember how her artistic talents and use of color are very distinct. Stacy studied painting at the Rhode Island School of Design and at the Maine College of Art. 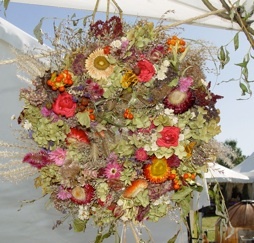 Her flower arrangements and wreaths are works of art. Many of her flower arrangements combine the bright colors that are similar to the vibrant colors found in South American handwork or the clothing handcrafted in India. 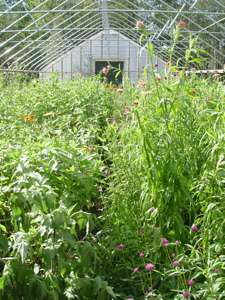 For over twenty-five years, Stacy has worked in the horticultural and organic farming world. She was employed in garden design on a two-thousand acre estate in San Jose, California. 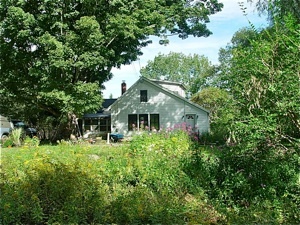 She lived off the grid in Vermont and practiced a self-sustaining lifestyle by raising dairy goats, chickens, pigs, ducks, and turkeys. 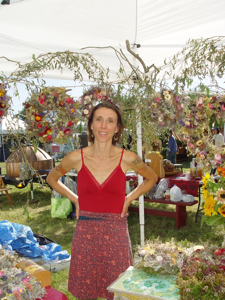 She is experienced in making goat cheese and knowledgeable of medicinal herbs, massage therapy, flower essences, and permaculture. Recently Stacy and her children were able to move into an old farmhouse on a five-acre farm. Stacy and her fourteen-year-old-daughter, Sage; seven-year-old daughter Tuala; and her four-year-old-son, Robear, all work together helping with the flowers, vegetables, and animal production. They are presently raising dairy goats, chickens, turkeys, and ducks. Stacy applied for a grant for NRCS funding to construct a high tunnel at her farm to extend the growing season, She was thrilled to be named a recipient. The greenhouse was constructed in the spring of 2013. Walking into the greenhouse is like entering another world. There truly is an other-worldly feel to the Leafsong Family Flower Farm. 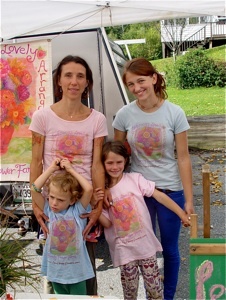 On her website Stacy refers to her children as the “fairy helpers.” There is a magical sense about the farm and the vivid colors of the flowers, the lush vegetation, and the fragrant blossoms all contribute to this idea of an enchanted land. When Unique Maine Farms entered the greenhouse, young Tuala and Robear were truly like wonderful fairy sprites as they navigated from one flower to the next sharing information about each one of them. The homeschooling education that is going on at Leafsong Family Flower Farm seems to be very alive, hands-on, and spiritual in nature. 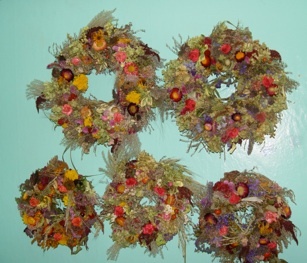 A deep respect for gathering is obvious when one looks at some of the natural materials that are being dried and incorporated into the various wreaths and flower gift baskets. 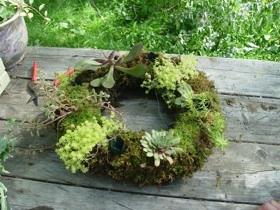 Stacy and her children create stunning living wreaths that are made with mosses, sedums, and succulent perennials. Creativity is embraced at the farm. Fourteen-year old daughter, Sage, participated with her friends and sold handmade items in the Youth Enterprise Zone at the Common Ground Fair. certainly excel in such locations since they have a great deal of experience in assisting in gathering flowers, seed pods, grass fronds, shells, lichens, feathers, rose hips, and other natural materials for their family’s creations. The Leafsong wreaths and floral gift baskets are now available online. 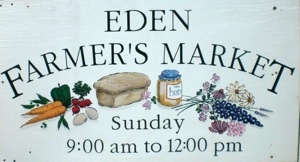 In the summer, Stacy and her children participate in the Blue Hill Farmers Market on Saturdays from 9 a.m. to 11:30 a.m. and at the Bar Harbor’‘s Eden Farmers’ Market on Sundays from 9 a.m. to noon. 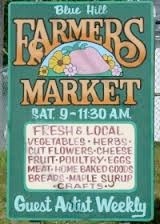 In the winter you can find them at the Local Farm Exchange Winter Market at the Mainescape Garden Center on Saturdays from 10 a.m. to 1 p.m. in Blue Hill. 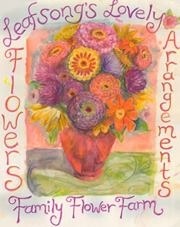 The Leafsong Family Flower Farm also maintains a Facebook page. If you check it out you can get updated on all that they are doing. 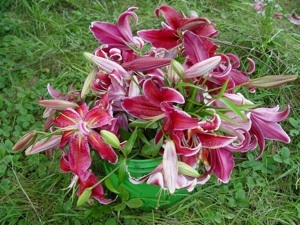 There are many photos of their beautiful flower creations. It is a great resource for anyone experiencing some cabin fever. When this particular profile was written for the Unique Maine Farms’ website, Maine was in the midst of the polar vortex. It was quite therapeutic logging on to the Leafsong Family Flower Farm website and Facebook page and having the opportunity to be transported into another world filled with bright flowers and memories of warm and sunny days. At the end of January, Stacy and her children were busy preparing for orders for their one-of-a-kind custom-made Valentine’s Day wreaths. Their focus on spreading a little love coincides well with the atmosphere that has been created at this newly-established family farm operated by a single mother and her three children.